Laser welded & silver brazed diamond blades are designed for professional users who require heavy duty and regular cutting of a wide range of hard and abrasive materials, such as building materials, asphalts, marble, granite, stones and so on. Laser welded diamond blades are made by the most advance and highly automatic laser welding technology. Diamond segments are firmly welded to the steel core by laser micro-fusion. Laser welded diamond blades are the most powerful diamond blades for they have Tough bonding, excellent stability, fast cutting and durable life. They even have an extraordinary performance on dry cutting without segment loss. 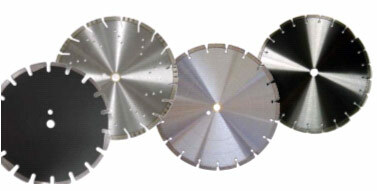 Silver brazed diamond blades are also known as high frequency welded diamond blades. The diamond segments and the steel core are rigidly welded together by silver brazing solders. The solders melt at a high temperature by a high frequency welding machine. Diamond segments of silver brazed diamond blades are replaceable, so they are more economical than the laser welded blades. Large sizes available only (usually from dia. 250mm). Different materials and purpose of use require different diamond density, type of segments and even type of slots. Use on tiles, bricks, concrete blocks, slates, stones or other building materials. For cutting concrete, reinforced concrete, cured concrete and other hard and non-abrasive materials. asphalt, green concrete, asphalt over concrete, etc. Protective segments are added to prevent undercutting. For marble, granite, limestone, sandstone, etc. For more information please contact us. All designs and specifications of laser welded diamond blades and silver brazed diamond blades are available upon request.